You were right. You guys rocked!!! We are sooo pleased with your performance, so please add us to your referral list. We were absolutely blown away with your performance on Saturday night! It was incredible! 1. Were you satisfied with the overall performance of the band? Would you hire them again???? Yes, we were extremely happy with the overall performance. They really know how to work the room. The dance floor was full all night. We would hire them again in an instant. 2. Did the band look and act professional throught the event? 3. 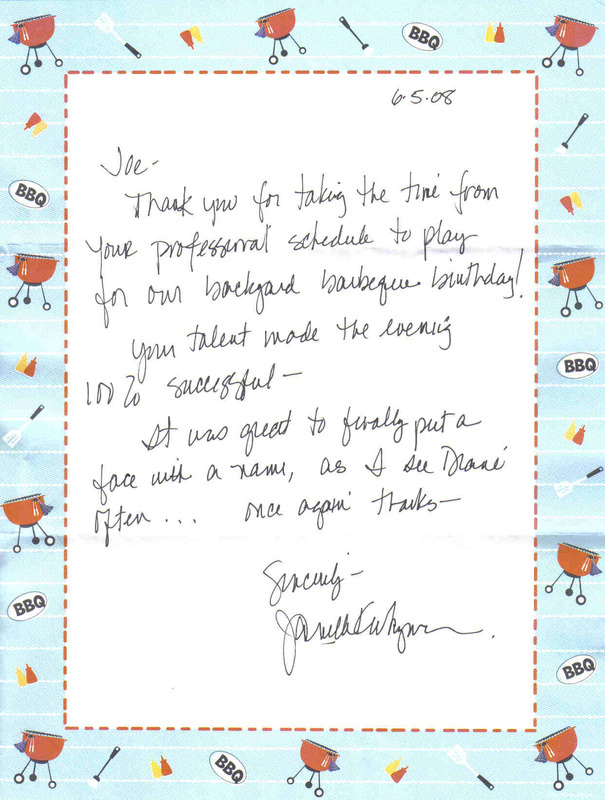 Were they easy to work with prior to the event and willing to accomodate all your requests? Joe was very helpful throughout the whole process. 4. Did they play a large variety of music genres WELL??? 5. If you requested ethnic music (ie. Jewish, Italian, Irish, Polish, etc), did they accomodate you and did they do it well? We provided our own polka music to play during the set break. 6. Were they willing to learn any new songs for you, and if so, did they perform the songs well? Joe played a couple of our requests during the classical guitar session during dinner. They pretty much stick to the songs on their list to keep quality intact. Our musical taste lies with jam rock which not everyone is in to and is difficult to replicate at a wedding setting. 7. Did they provide good DJing and announcement services? Yes, Joe did a great job and paid attention to detail. 8. Did they show up on time and have everything ready before your event began? 9. Were they willing to work with you on the selection of music that you wanted them to play, or did they play whatever they wanted during the event? Yes, they played most of what we requested from their list. 10. Did they provide cocktail hour music, and was it good? Yes, it was very good. All the musicians were very talented. 11. Did you look at other bands in the area, and what made you hire About Face Band? Would you recommmend any other bands to me? We tried to book other "popular bands" in the area but were all booked. Found About Face through a online booking agency. I think they were much better that many other of the bands we heard in the past. Alla, as you can tell, we were very happy to have Joe and the band. It was worth every penny and added what we were looking for in a band. They were not "cheesy" as some bands/DJs can be. Total professional act. We booked them without hearing them play live and as you can imagine were a bit uneasy with that decision. 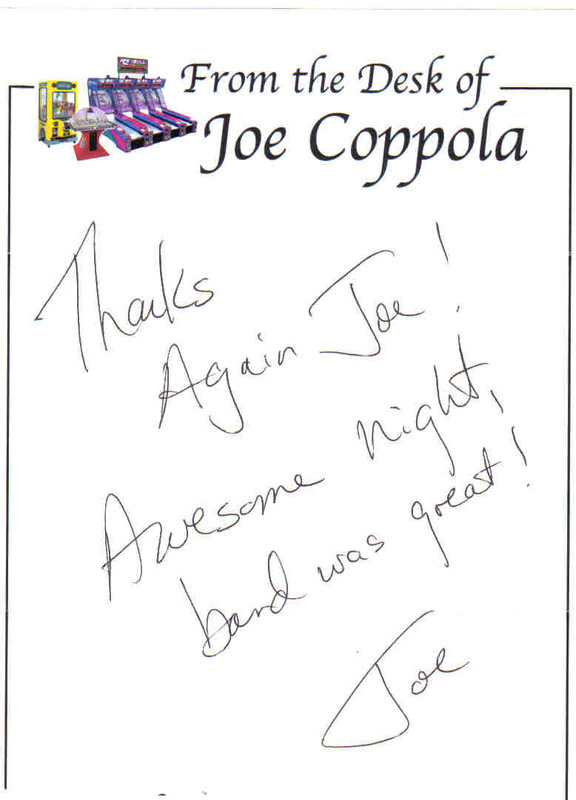 We did see Joe play with his blues band and knew by his talent he was not messing around. If you need anything else, feel free to contact me again. Good luck and congrats! Great show on May 16th at Verbena! Dan and I are glad we were able to make it. We were assured all over again that we made the right choice by going with About Face Band. I actually just got on the computer to tell you what a wonderful time everyone had at the wedding because of the band. I cannot tell you how many people asked me about the band. You totally made the wedding happen. Thank you so much!!!! You are all awesome. Thank you so much for helping make our wedding everything we hoped it would be. You guys were awesome. 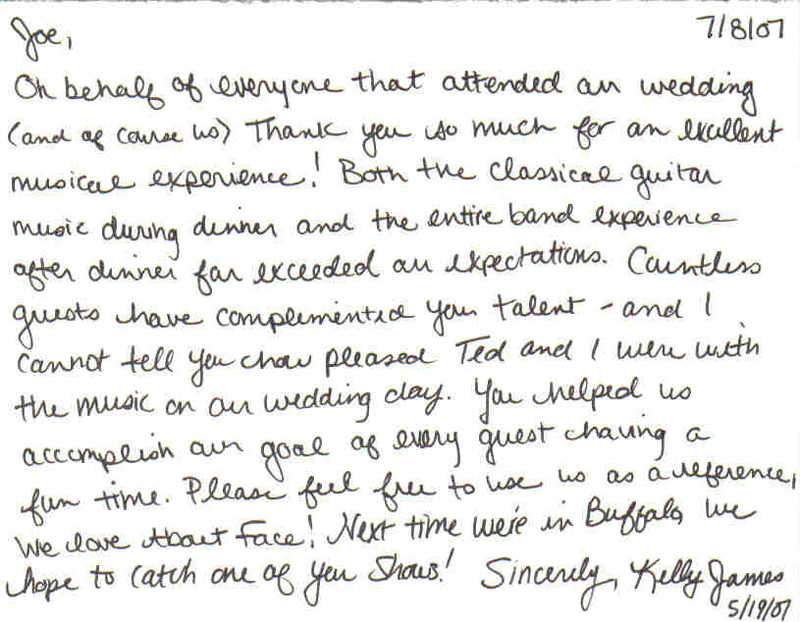 Our guests can't stop talking about the band. We had a great time at our reception. Thank you so much for making it so memorable! I can see what all the fuss was about when I was reading your testimonials before we booked About Face Band. WOW! This is the word we've been hearing ever since the 15th when we ask our guests what they thought of the music. There is even one gentleman who was so impressed, and indicated to us that he is interested in hiring About Face Band to play at his wife's 60th birthday party next year. Dan and I are thanking you tremendously and are convinced it was the best money spent that day. There were times I thought our guests had made a quick exit, but realized that the chairs were all empty because the dance floor was rockin'! It was so great, and so satisfying to see everyone having so much fun. I appreciate you accommodating us down to the very last minute. You guys were fantastic and are truly the best talent that I've seen here in WNY. We are happy to be on your mailing list for future events that you will be playing, and would accept any email or phone calls from your prospective clients to give nothing but the best recommendation. Fantastic job at the wedding Saturday! I almost jumped up there and sang along with you!!! Everyone said you and the band did a great job!!!! By the way, your drummer is the drummer at our church!!! Take care and hope to see you again soon!! Thank you again for making the wedding great! Everyone loved you guys and we really were so happy that you were our band. Please add me to the referral list and believe me - you will hear from us again! Thank you for everything and making my wedding so memorable. 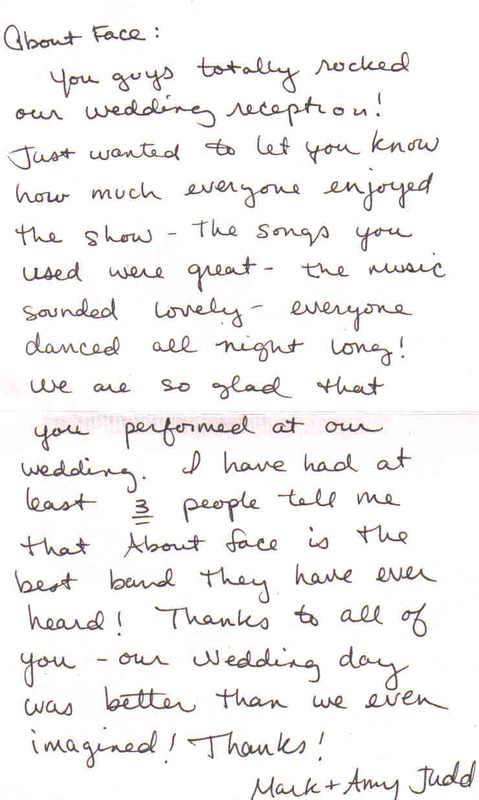 Thanks again for playing at our wedding...we're still getting compliments on how great you guys were! Enjoy the rest of your summer. You are a fantastically talented guitarist. About Face just played at my wedding this past weekend. They were unbelievable. Everyone was shocked by how good they were...they are definitely not your typical wedding band! People danced the whole entire night...all the music was upbeat and energetic. We honestly couldn't have been happier. We chose About Face because we liked the "package" idea. Most bands don't offer you music during cocktail hour or dinner. We had the jazz duo during cocktail hour, which I didn't see much of because we were taking pictures but I heard was great. Joe played classical guitar during dinner and it was just beautiful...he is very talented. I wouldn't worry too much about them not being able to accommodate your requests. Everyone probably has specific songs they want to hear and it would be hard for a band to learn new music for every wedding they go to. We compiled a 30 minute playlist for the band's break so we could hear the songs we wanted. I assure you that the music they play is well worth it. 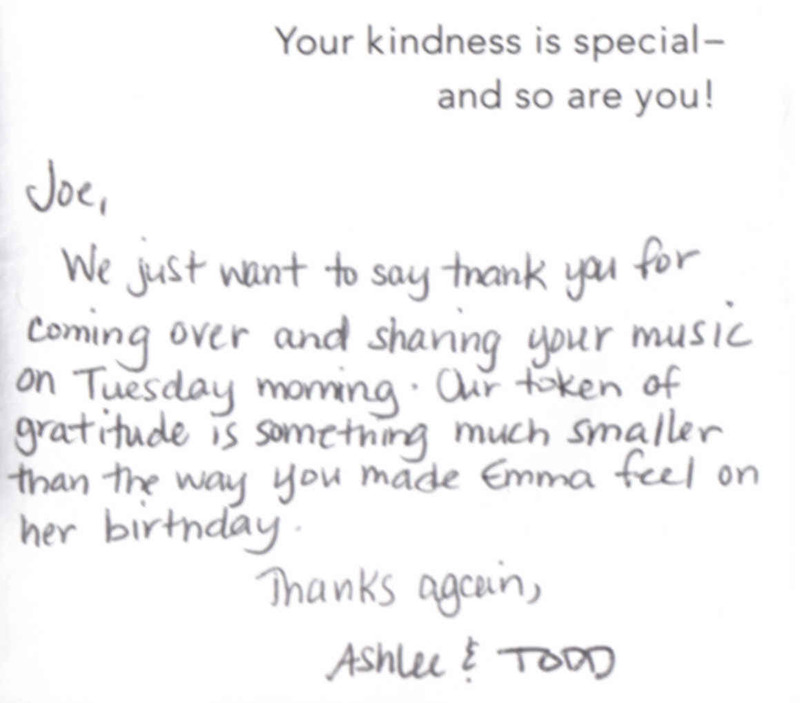 Joe was really accommodating from our experience...I guess it depends on what and how much you are demanding. the band was amazing at directing people's attention. I know I've been to weddings where I didn't notice the cake cutting and other formalities. People knew exactly what was going on at all times. It seemed like all 200 guests were watching all our first dances. They had a great way of letting people know what was going on without being annoying or forceful. I really do hope that you go with About Face...I promise that you won't be disappointed! Joe...you guys were awesome! I can't tell you how many people asked us where we found you...everyone was surprised by just how good you were. Feel free to use Jeff and I at any time in the future as a reference. We will definitely be passing along your info to everyone we know in need of a band! I was going to call you today to tell you how fabulous you were and how many people called me today about a great party and how wonderful the music was. You were awesome--the best classical guitar around!!!! Thank you for making the party. Definitely use my name and I hope we'll see you soon. We had a great time at our wedding because of the music About Face performed. Thank you so much and we will certainly tell our friends about you. Hi Joe, I was going to call you today to tell you how fabulous you were and how many people called me today about a great party and how wonderful the music was. You were awesome--the best classical guitar around!!!! Thank you for making the party. Definitely use my name and I hope we'll see you soon. Thanks Again. You did a terrific job at our holiday party. So many people have complimented on the variety played and sound of the band. THANK YOU!!! The party went by too fast and wish it had ended later than 11. Please feel free to include my name and contact information as a reference if you need to supply this information to someone. Thanks again! I wanted to know some info and thoughts on the band Aboutface for wedding music. im currently planning my Sept '08 wedding at Harry's Harbour Place and my fiance and i are in the mode now of deciding if we want band or dj. we are doing dinner stations not a sitdown dinner so we wnat the entertainment to be good. so let me know your thoughts and your experiences if you get a second, i would greatly appreciate it!! we have ben looking at other bands and many sound like a horrible kareoke band and others seem to only play the cheesy wedding music. aboutface seemed to have a great song list, any thoughts or info would be great!!! thanks! Hi Jen! Honestly, you couldn't choose a better band! I just had my wedding on May 19th at the Butler Mansion, and the thing we heard most from our guests was how awesome our band was! The thing I wanted most at my wedding was for everyone to have fun. About Face basically made that happen! I had Joe play the classical guitar through dinner (which was perfect) and then after dinner they really got everyone up and dancing! They even didn't take as long of breaks as they were supposed to because they were so excited about our crowd! That was impressive. Also, my videographer had a sound malfunction and About Face agreed to play the songs they played at my wedding in the same sequence so he could re-record. They really just go out of their way. My cousin just got married at the Buffalo Club on October 13th, and she hired the **** ** ******. While that band was good, my family and I concluded that About Face was by far the better band! :) I know it's hard sometime with money, Ted and I had considered a DJ, too. But I really think it's a totally different experience with a band - it's so much more interactive and About Face really gets the crowd involved more than a cheezy DJ could. It was probably the best investment of the wedding. Joe is also very organized, and easy to communicate with. Have you heard About Face play? I know they do a bunch of shows downtown, and if you haven't heard them, you should definitely try to make a show. Harry's Harbor should be a beautiful location! Ask Joe if About Face has ever played there before. He knew the set-up deal with the Butler Mansion because he'd played there before, so you can get an idea of how things will be set up. Ok, I hope my novel helps! If you have any other questions, I'd love to help out! Best Wishes! Just wanted to let you know how much we all enjoyed your performance at the Conewango Country Club in Warren PA on 9/22/07. Your song selection, performance and professionalism in terms of the cooperative presentation with the Salsa band provided an exceptional evening of fun and music. This opinion was shared by all. Best of luck with your ongoing performances and hope to hear you guys again. Simply said, you guys were awesome. We had some high expectations for you given what we have heard from other people, and you managed to exceed them. You made it easy for us and fun and I am still very impressed with how well you collaborated with everyone. 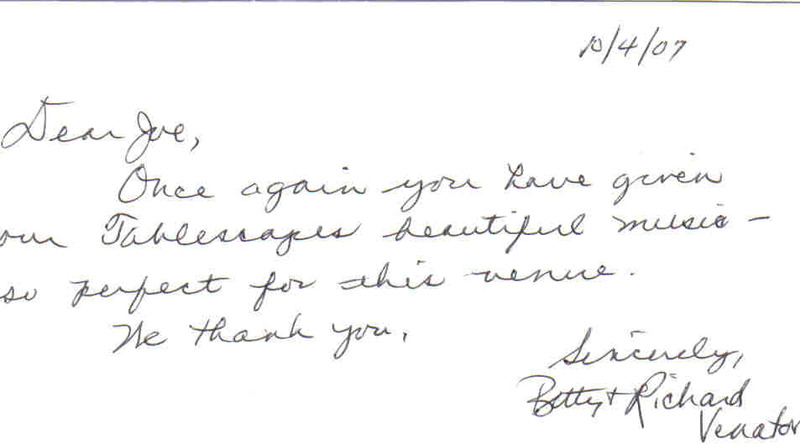 We also received a lot of compliments from our guests, many of them from big cities who have seen a lot. Thank you and everybody in the band for making it a great night! Everyone is still raving about what a great band we had. I want to thank you again for a fantastic performance at the wedding last night. Kelly and Ted were thrilled. Several guests came up to my husband and I over the course of the evening to let us know how much they were enjoying the music. From the classical guitar during dinner to the last number on the dance floor, everything was A++! WOW Joe and the rest of the Band. You were outstanding at the 50th! The entire family and our friends are still talking "About Face" Thank you again so much. Thanks again for all your help with this. 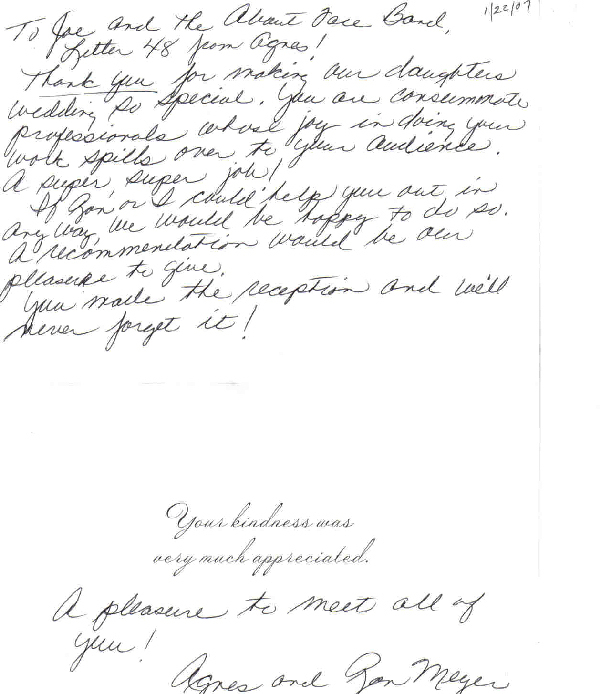 We now understand why so many of your previous customers and references said that you were a pleasure to work with. Joe, I just got the pictures back on our Holiday party in early January. The pics reminded me of what a joy it was to work with you and the band. About Face was terrific and you made everyone who was there feel good about their association with SAC. Hope all is well with you and hope to see you again next year. Thank you for all that you and your crew did to make the wedding on Saturday a success. I am going to put your on our vendor reference list. Hi Joe, Just wanted to let you know you guys were awesome. 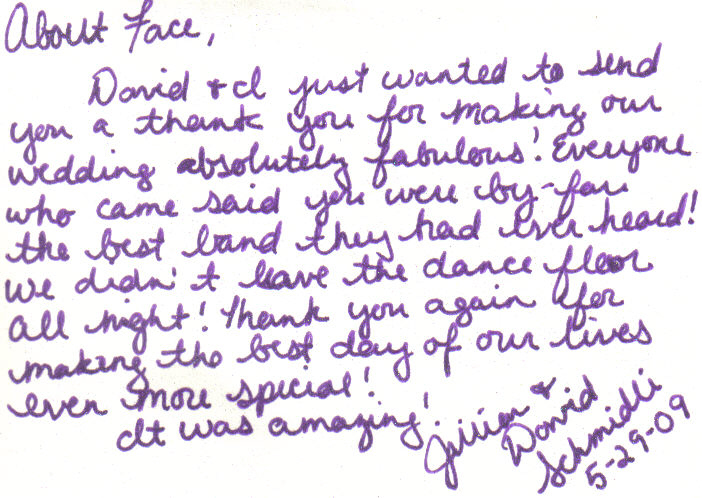 Everyone is raving about how great the music was and how much fun they had. Thank you for making my day great! 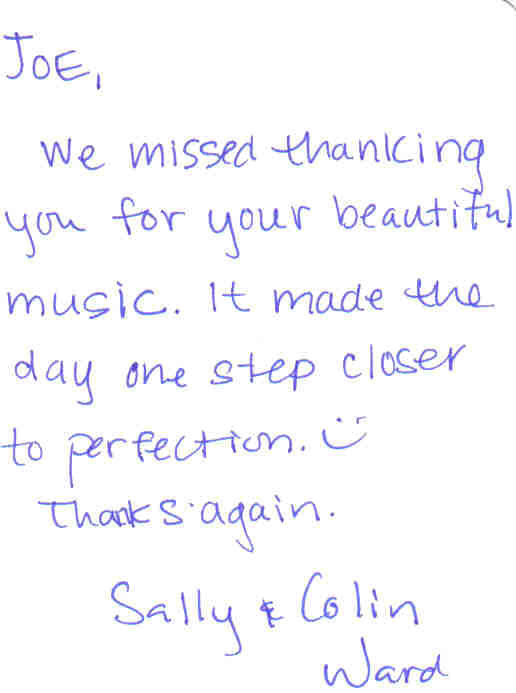 Your strong, amazing voices and wonderful instrumental talent always make us smile. We had a lot of fun! Thank you. I think the membership/guests would be completely entertained by About Face. This group would be a perfect fit for the two-day or three-day. I guarantee this band will blow away any others you might have used in the past! Thanks Wess! 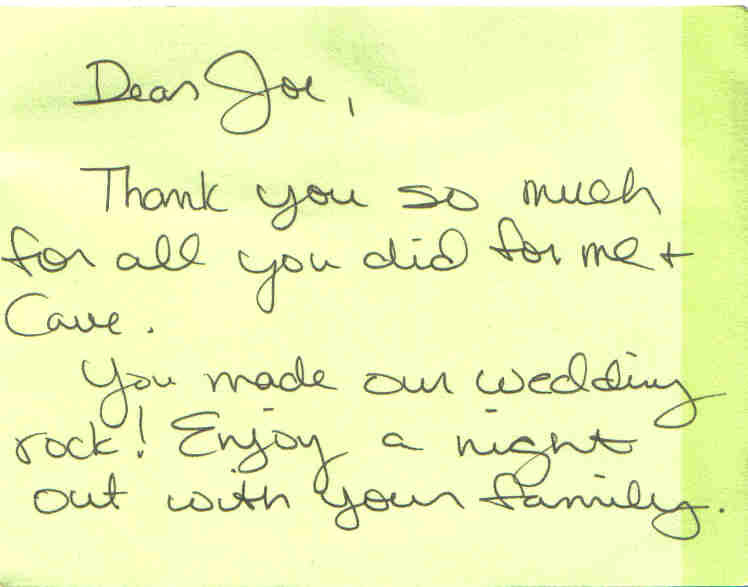 Just a quick note thanking you again for your great work at our wedding on August 5. The song selection, musical prowess, and all out fun factor were all off the charts. The only people that had more fun than our friends and family were Alisa and I. "Wow, you guys were great! I mean you played everything. I've never saw a band go all the way to the Bobby Darin era and follow-up with a brand new OutKast tune. The people loved it and the dance floor was packed the entire night." We've been getting so many compliments about the band, everyone enjoyed you and had a great time. Thanks for everything! Dan and I were so pleased." 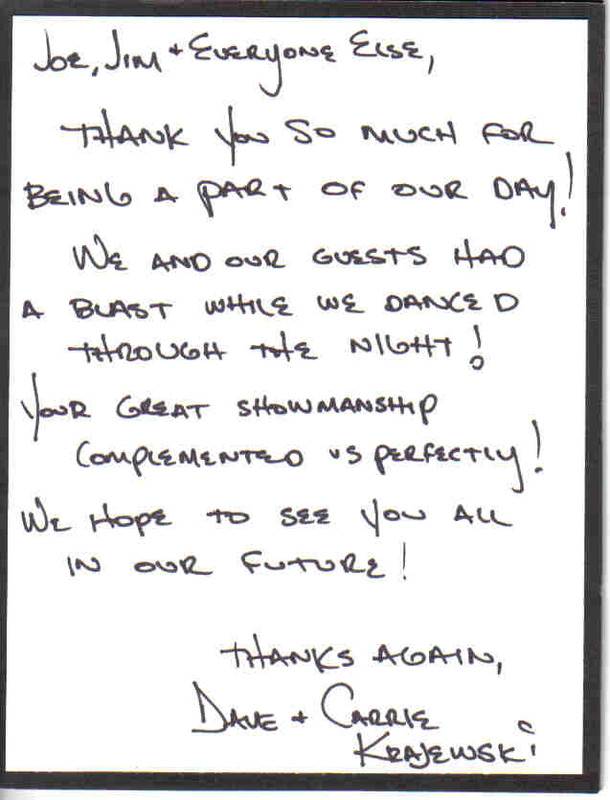 "We just wanted to thank you and the band for a great performance on Saturday. We got a lot of positive reviews. We appreciated you being so flexibile with the breaks. Taking requests worked out well. Everyone seemed to enjoy themselves and we hope you did too. Oh, getting Greg up there was great too."